The value determines the power. The Bible says, "He who receives a prophet in the name of a prophet receives a prophet's reward" (Matt. 10:41). What is a prophet's reward? The ability to see and hear. Jesus stood before a crowd and shouted, "HE THAT HAS EYES LET HIM SEE, AND HE THAT HAS EARS LET HIM HEAR!" He was acting as a prophet. He who receives a prophet in the name of a prophet shall receive a prophet's reward; and he who receives a righteous man in the name of a righteous man shall receive a righteous man's reward (Matthew 10:41). Everyone who valued Jesus as a prophet and received the words He shouted, received the ability to see and hear. A grace was released with His words that opened their eyes and ears! Valuing the word of the Lord means that we make time to hear Him. Moses walked past the burning bush in the desert and heard nothing until he stopped and turned aside; we need to set aside time to diligently seek God ourselves with our whole heart. The angel of the Lord appeared to him in a blazing fire from the midst of a bush; and he looked, and behold, the bush was burning with fire, yet the bush was not consumed. So Moses said, "I must turn aside now and see this marvelous sight, why the bush is not burned up." When the Lord saw that he turned aside to look, God called to him from the midst of the bush and said, "Moses, Moses!" And he said, "Here I am" (Exodus 3:2-4). But from there you will seek the Lord your God, and you will find Him if you search for Him with all your heart and all your soul (Deuteronomy 4:29). For the eyes of the Lord move to and fro throughout the earth that He may strongly support those whose heart is completely His. You have acted foolishly in this. Indeed, from now on you will surely have wars (2 Chronicles 16:9). Even if God speaks audibly from Heaven, some people would only hear it as the sound of thunder. The difference between the deaf and the hearing is not how loud God speaks, but how open we are to hear Him speak. "Father, glorify Your name." Then a voice came out of Heaven: "I have both glorified it, and will glorify it again." So the crowd of people who stood by and heard it were saying that it had thundered; others were saying, "An angel has spoken to Him" (John 12:28-29). As we are learning to hear the voice of the Holy Spirit, we must realize that not every voice that speaks to us from the spirit realm is from God. Beloved, do not believe every spirit, but test the spirits to see whether they are from God, because many false prophets have gone out into the world (1 John 4:1). In First John 4, we are instructed as "the beloved" to "not believe every spirit but test the spirits to see whether they are from God, because many false prophets have gone out into the world." In this passage of Scripture, it is made clear that we—the beloved—are able to hear from spirits other than the Holy Spirit and are warned not to become false prophets by listening to the wrong spirit! 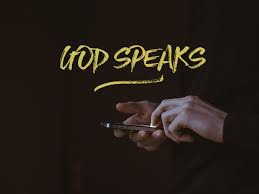 Therefore, if it is possible to become a false prophet by listening to the wrong spirit, then it becomes vital to know which voices can speak to us. Who Is Speaking to Us? Our spirit: We are a spirit that has a soul and a body. When we are born again, our spirit comes to life making it possible to hear from the spirit realm, but not necessarily hearing from the Holy Spirit. Hearing from our own spirit is still a spiritual experience and being aware of this will help us discern which voice is speaking to us. The Holy Spirit: This is God's Spirit, the one who we are building a relationship with and learning to hear clearly. Evil spirits: Spirits from the evil realm can speak to Christians just as they spoke to Jesus when He encountered satan in the wilderness. Angels: According to Hebrews chapter 1, these are spirits sent to render service to the saints. Angels also speak to us about the things of God. It takes time to learn to discern what spirit is speaking to you and there is no substitute for experience. A banker who had reached the age of retirement was about to be replaced by a young man. Upon his arrival to take the helm from his predecessor, he asked the older man how he became successful. The man replied, "Good decisions." "How do you make good decisions?" the young man asked. "Experience," the banker replied. The young man thought for a moment, and then inquired, "How do you get experience?" With a warm smile aged with wisdom, he replied, "Bad decisions!" You cannot grow in the gifts of the Spirit without making mistakes! We gain experience as we step out in faith trying to listen to the Holy Spirit.